A unique range of handmade chocolates using only the finest imported Belgian couverture chocolate in milk, dark and white. Chocolatier Australia make a wide range of affordable premium luxury chocolate, loose, seasonal and boxed. Their full range can be purchased from their shop in Ivanhoe but can also be found in major retail outlets across Australia, 5 star hotels, major international airlines, major sporting events and corporate hospitality venues. 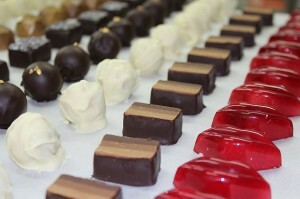 They also offer personalised chocolates for weddings, birthdays, anniversaries or any other social occasion. 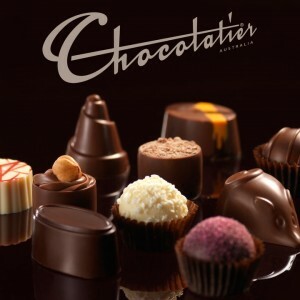 Chocolatier Australia is one of a small group of Australian manufacturers who are licensed under the Fairtrade Labelling Organization of Australia and New Zealand. Fairtrade is an alternative model of international trade which aims to share the benefits of trade more equitably between consumers, producers and the environment. Their Fairtrade range currently comprises 2 gift boxes in milk and dark Chocolate and 2 Easter eggs in milk and dark chocolate. For more information about Fairtrade please visit www.fairtrade.com.au. 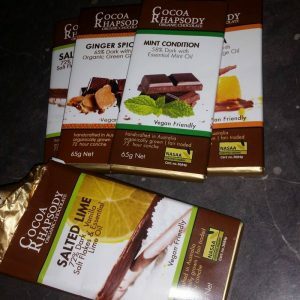 Cocoa Rhapsody sells Certified Organic chocolate, with much of the range also being vegan friendly. There are a wide range of flavours, including nectarines, strawberry, raspberry, blueberry, blackberry, walnut, kiwifruit and peach. The cocoa beans are processed to a conch time of 72 hours to produce a smooth, silky textured chocolate (conching is essentially the grinding of the cocoa beans – the longer the conch time the smoother the chocolate). The chocolate is made using organic, fair trade, cocoa beans grown in the natural rainforest environment in the Dominican Republic, where the farmers above the market price for their beans. They also receive a 2% royalty of all chocolate sold which is contributed directly to the ‘hand in hand’ fund for fair trade. 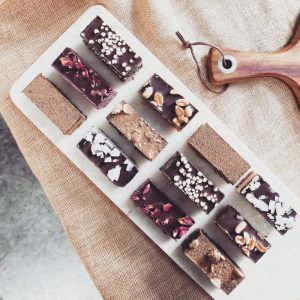 Girl Made Chocolate produce handmade, raw chocolate blocks which are vegan, dairy-free and refined sugar-free. They use Certified Organic ingredients. Their flavours include salty walnut, chilli, goji berry and mint. Their chocolate is healthy for both humans and the environment. Manuko make a range of chocolate slices and truffles, stocked in select cafes and specialty retailers around Melbourne. All products are made from Certified Organic ingredients, and are raw, gluten free, dairy free, refined sugar free and vegan. Their products have a two month shelf life when stored refrigerated. Their slices include salted caramel, turkish delight, hazelnut ganache, otway walnut ganache, peanut crunch, matcha mint, choc jaffa and choc coconut. Their truffles include original, turkish delight and mint. 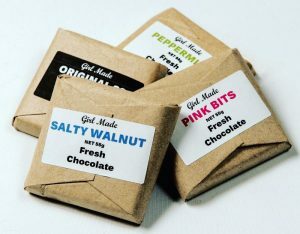 Considering the many artificial additives, GMOs, and other expendable food processes that we are unwittingly subjected to, Organic Times wants to provide a range of quality, fair-trade chocolate products that not only taste delicious but are made from certified organic ingredients that are both better for us and for Mother Nature too. 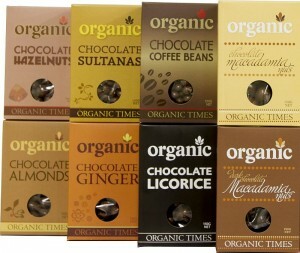 Their signature line is their Organic Chocolate Licorice, which goes magically with their chocolate. Complementing this magic taste is Rapadura sugar – an ingredient in their chocolate – grown and produced by Hand-in-Hand, their fair-trade partners. The special thing about Rapadura is that it is an unrefined sugar made from minimally processed organic cane sugar. This means that the molasses and all the goodness remains in the sugar, creating a rich, caramel flavour and a higher mineral and vitamin content. As innovators of introducing organic chocolate-coated produce to the market, they use premium, organic couverture chocolate and specialise in coating organic produce such as macadamia nuts, roasted almonds, hazelnuts, coffee-beans, sultanas, ginger and licorice. Their range comes in both dark and milk chocolate. Their chocolate is made using certified organic cacao bought through the Hand-in-Hand fair-trade system which is then processed and manufactured according to an old-established Swiss chocolate recipe. The produce they coat is also certified organic. They use fair-trade organic coffee-beans and most of their other produce is sourced from Australian organic farmers. In addition to their chocolate-coated line, they also bake delicious, home-style organic cookies, using their organic chocolate in a variety of flavours. And if you are looking for organic ingredients, they offer butter, sugar, flour, cocoa and carob powder. Ratio Cocoa Roasters uses traditional chocolate making techniques and sources the World’s best single origin cacao beans to bring you individually flavored small batch hand crafted chocolate bars. Their cacao beans are sorted to remove any flawed beans then roasted in an antique ball roaster before being cracked & winnowed to remove the husk or shell of the bean. The cacao bean is now in small pieces called cocoa nibs. Their dark chocolate range is a mixture of these cocoa nibs and raw cane sugar (and is therefore vegan). Their milk chocolate range has two additional ingredients: whole milk powder and cocoa butter. The chocolate ranges from 45% to 100% cacao. There are no preservatives or additives. The ingredients are placed in stone grinders for a minimum of 72 hours, during which time the coarse ingredients turn into a smooth liquid. They then block and age the chocolate for a minimum of 3 weeks before it is tempered, poured into moulds then hand wrapped. They are also a cafe, selling hot chocolates, coffees and sweet treats. They are also the only dedicated chocolate gelato store in Melbourne, with 7 different chocolate gelato on offer (2 vegan). The cafe is open Thursday and Friday, 2–10pm; Saturday, 10am–10pm; and Sunday 10am–5pm. They also do public tours of their factory on most Fridays and Sundays. $10. Book on EventBrite. You can read more on the following websites: Artisan Selections, Broadsheet, Good Food, Melbourne Darling, Melbourne LYF, The City Lane, and Urban List. The Magic Pantry’s products are made using Belgian Couverture. Lovingly made by hand with the finest ingredients, Van Nunen Chocolates offers their exquisite chocolate range for your special occasion or event. Available as boxed selections or tailored to meet the requirements of your function, they offer you a chocolate experience of pure indulgence. 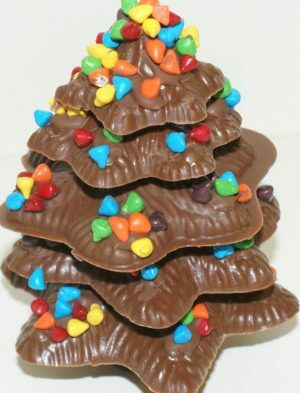 Yarra Valley Chocolaterie & Ice Creamery has over 250 different delectable chocolate delights and related products, including: truffles, pastilles, chocolate bars, nut clusters and rocky road, bush tucker chocolates. 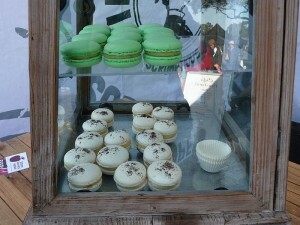 They also sell macarons, fudge, nougat, biscuits, chocolate sauces, chocolate spreads, mousse logs and take home ice-cream tubs. The product range features fruits and nuts picked from the Chocolaterie’s own orchard of cherries, plums, apricots, citrus, quince and almonds, locally-sourced provisions and the best quality, Belgian couverture chocolate. 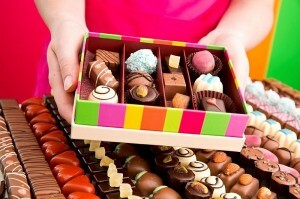 They welcome everyone with free chocolate tastings and displays of thousands of premium chocolates. You can also watch their European chocolatiers at work handcrafting and handpacking their creations. When tastings are done, children are encouraged to roam and explore the Chocolaterie’s lawns, native gardens, orchard and developing wetlands conservation area on their beautiful property. Set on 16 hectares amongst one of Australia’s premium wine regions and surrounded by picturesque Yarra Valley vistas, an emerging orchard and sweeping lawns, the Chocolaterie is an experience the whole family can enjoy. Finally, stay a while and enjoy the peaceful Yarra Valley views in their cafe. Breakfast, morning tea, lunch or an afternoon treat – their menu features produce from their kitchen garden or sourced from nearby farms. And, of course, desserts, fondue, pastries and ice creams.